Use great free online tool to optimize your images before you upload them and insert them to your wordpress post. If you care about loading speed of your blog or website, it means you also care about your visitors. 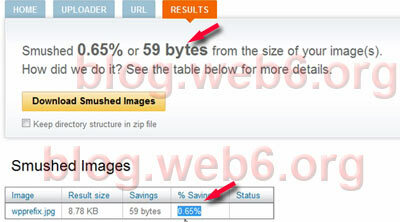 Not to forget it will give you benefit, more spare space in your webserver for images or other things to upload. Our blog visitors can be from a country where their internet speed is not too fast enough to download images and other content of our sites. One of many ways to do site-performance optimization is optimize your images, can be in jpeg, gif files, etc, with Smush it tool from Yahoo! Developer Network. What it will do is resizing the size of these images. 1.Prepare the images you want to upload and insert to your wordpress post. 4. Choose your images that you want to compress, you can upload more than one, use your shift key. 5. It will begin to be size-reduced. 6. Once it is finished, it will show you how many bytes or kb and precentages you save. Your images size will be reduced. 7. Click the “Download” to download the smushed images back to your computer, and you can use them for your wordpress posts. Don’t forget to trash the original images. Tips: Clicking the “keep directory structure in zip file” can be useful if you want to compress images from a folder. Now this was intriguing. I wish there was a program to use instead of having to go to a website to use their tool. Thanks for sharing! Yeah it is an online tool, sometimes quite annoying because whenever i create a post even some ads banner i have to compress first. Though you can use imageoptim if you use mac. It is a program to compress png file. No problem. And I don’t have a Mac, so I figure this isn’t quite for me right now. But someone might enjoy it. Thanks for this useful info, haven’t heard, and will definitely try this plugin, sounds very useful.